On May 21, 10gen organized the second conference dedicated to MongoDB. Like MongoSF, MongoNYC included a great line-up of speakers. One of the more popular talks was Kyle Banker’s Schema Design session, which was so crowded that many attendees sat on the floor! Both the video and slides from the talk are now available. Also interesting were the many talks on MongoDB production deployments. Kushal Dave, the CTO at Chartbeat, gave an excellent talk on how Chartbeat came to use MongoDB after trying many solutions to store historical data analytics (see slides & video). Jay Ridgeway talked about bit.ly user history, which is auto-sharded using MongoDB (slides & video). Gilt Groupe demoed their real-time analytics tool Hummingbird, which is built with MongoDB and node.js. Avery Rosen, the CTO of ShopWiki, wrote a recap of his talk “Finding a Swiss army data store” on the ShopWiki dev blog. Another big hit was Harry Heymann’s presentation on MongoDB at foursquare, the video of which is included below. 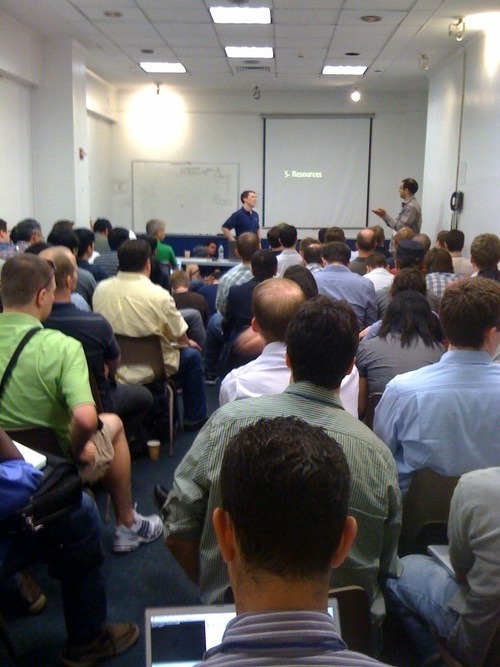 Videos from all the talks at MongoNYC are available at mongodb.blip.tv. Thanks for making the event such a success! We’re getting really excited about MongoUK and MongoFR, which are only a few weeks away.